For nearly 20 years Jerusalem was a divided city. 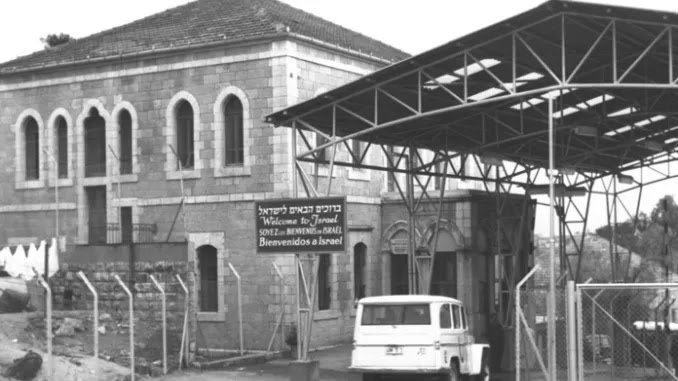 An international border ran right down its middle and one of the only places where crossing was possible was at the Mandelbaum Gate. Today almost nothing remains of this remarkable place but its story is as fascinating as ever, and the walls and checkpoints which now surround and even intersect East Jerusalem remind us that division of this holy city is not entirely a thing of the past. To build a gate, there first must be some kind of barrier. The barrier in this case was the fortified ceasefire line from the War of 1948 - usually known in Arab and Jewish camps respectively as Al-Nakba (the catastrophe) and Mil'hemet Hashi'hrur (the War of Independence). 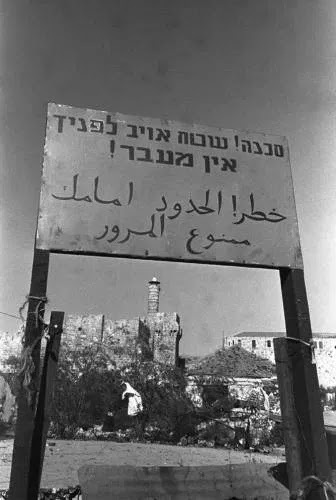 The line was hastily drawn up between Moshe Dayan, commander of the Israeli forces in Jerusalem, and his Jordanian counterpart Abdullah a-Tal, in a house not far from the future Mandelbaum Gate, in November 1948. The line was never intended to be permanent, nor to become an international border for nearly two decades, and certainly not to remain the source of fierce debate in the United Nations surrounding a two-state solution and the creation of an independent Palestine, over 70 years later. The line they created was not particularly accurate but was drawn in green ink - and is still known as the 'Green Line' to this day. The Green Line forced an unnatural and quite new division upon Jerusalem into 'Jewish' and 'Arab'. Most of the north, south and east of the city was under Arab control. This meant the old city and Mount of Olives were both in Jordan, including the Western Wall and the ancient Jewish cemetery. The Western Part of the city, including the train station, main road to the coast and the fertile plains beyond, were in the new state of Israel. Local people were not allowed to cross from one side to the other but for diplomats, religious leaders and international visitors safe passage had to be granted - thus the Mandelbaum Gate was born. The crossing borrows its name from the Mandelbaum house which once stood nearby. Simcha and Ester Mandelbaum were Jewish stocking manufacturers who moved here from the old city, building a grand family home in 1929. They hoped that they would set an example to other Jews who would follow them to build a whole neighbourhood in the area, in what at the time was one of the most distant outposts of Jewish Jerusalem. The surrounding land was mostly owned by the waqf (Islamic trust) however and their plan failed. 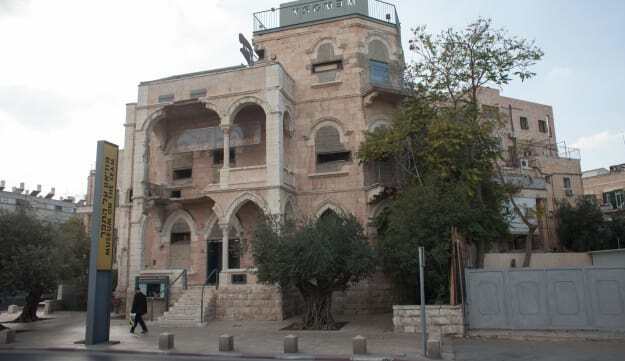 During the war, fighters from the Jewish paramilitary group the Hagana ('The Defence') took over the building and used it as a safe house in the fight against the Arabs on the other side of the street, before it was blown up July by Jordanian forces, killing the 38 men inside. Little remained apart from the front gate, just on the Israeli side of the Green Line, and it was here that a larger 'Mandelbaum Gate' was then built. "The gate was not really a gate but rather two roadblocks manned by armed soldiers standing beside sandbags. These checkpoints were separated by a stretch of rough cobblestone, pockmarked by ugly cement cones that stood three feet high and served as tank traps. Rolls of barbed wire extended along the road for several hundred meters, separating Israeli controlled West Jerusalem from Jordanian controlled East Jerusalem. The no-man's land between the two was like an ugly scar of abandoned streets and ruined buildings, dividing East from West, Israeli from Arab. Military engineers from both sides mined and periodically re-mined this gash running through the city." As the son of an American diplomat, little Kai could live on one side and go to school on the other. UN peacekeepers and foreign embassy staff crossed frequently. Tourists could cross too but only in one direction. Pilgrims were also occasionally allowed passage - for example Christians were allowed to make the procession to Bethlehem every December or January (depending on their denomination). Other than this the Mandelbaum Gate was usually a lonely place, where tensions ran high and frequent, often lethal, skirmishes broke out. This was the situation until the truce formally ended in 1967. 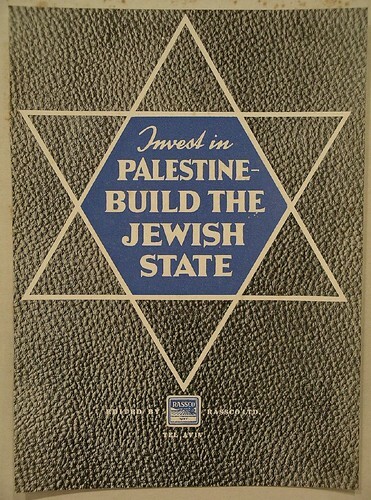 During the 'Six Day War', Israel conquered the West Bank of the Jordan River and East Jerusalem was annexed to the State. The gate was immediately destroyed along with the remains of the original house. Many declared Jerusalem liberated and that it would never be divided again. But today there are still a few reminders of this era. One of the checkpoint buildings is now a Jewish yeshiva (religious school). There is a monumental sundial in the middle of the street and light rail tracks on the exact spot where the crossing once stood. A square nearby is still named Mandelbaum Square. And the Israeli guard post which observed the crossing, the confiscated Tourjeman House, is now the Museum on the Seam. However the most tragic reminders can be seen several kilometres to the east of here. Although a wall no longer cuts through the middle of Jerusalem in such a visible way, the city remains divided until this day. While it is tempting, as this article has done, to look back on the days of the Mandelbaum Gate as a romantic era of diplomacy and espionage, the truth is that walls always divide and control people. The Israeli West Bank barrier (separation wall, security fence, etc.) continues to divide Arabs and Jews today. But at many places it divides Palestinian neighbourhoods and at several places, including Qalandiya, Shuafat refugee camp and Anata, it divides not only Arabs from other Arabs but even residents of Jerusalem from other residents of Jerusalem within the city's municipal boundaries! Yes, the wall was willingly built to divide the city. Israeli security experts tell us the wall is a regrettable, but necessary, step to keep Jews safe from terror. But the Wall, and walls in general, do more than this. They represent a total collapse in faith of the capacity of the human spirit and a brutal denial of people's ability to change. They represent fear and not love, the worst of us and not the best. But by this logic, gates - from Mandelbaum to modern checkpoints - therefore represent a reluctant admission that indeed we cannot fence off our problems or ignore our disagreements forever. Who can forget the images as another infamous dividing wall was torn down in Berlin in 1989? No-one celebrates the construction of a wall like that. And yet walls continue to be built, from Maale Adumim to Mexico. Most of our Jerusalem tours discuss this issue in some detail. 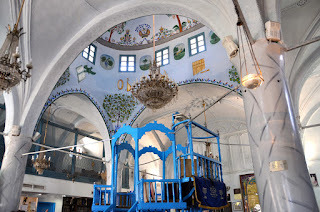 See our full day Jerusalem, Greater Jerusalem and especially our East-West Jerusalem tour pages for more information.